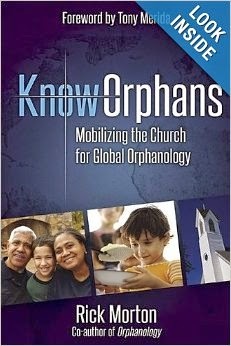 I accepted KnowOrphans : Mobilizing the Church for Global Orphanology for review out of curiosity. Our family has adopted and so it is a topic that I am interested in. I wouldn't say that we're one of those families who becomes passionate about adopting to the point where it takes over our entire identity. Most of the time we forget that one of our children is adopted. Your children become a part of you, regardless of how they arrived into your home. Adoption, like home schooling, is not something that I think everyone is called to do. In fact, there are some people I don't think should ever consider the idea of adopting just like there are some people who absolutely should not attempt home schooling. Just because one person is called to it, doesn't mean another one is. There was a part of me that was afraid author Rick Morton would try to convince everyone to adopt. When I cracked open the pages of KnowOrphans I was rather suspicious that this would be the case, but my fears were instantly assuaged. Morton is not trying to convince people - specifically Christians in the church - to adopt. In fact, he argues that our first concern should be to support families so that they can remain intact. He believes that it really is in everyone's best interest for families to stay together and learn to function within the original family unit. However, the fact is that some parents around the globe are unable to keep their children with them for any variety of reasons. When this is the case, then it should be our priority to help keep kids in the culture that they were born into. When this is also not a possibility, then adopting internationally should be supported. In all of this, I agree with him for many reasons which I have no intention whatsoever of debating with anyone. Morton's mission with this book is provide ideas for churches to become actively involved in supporting orphans around the globe. My husband and I have been talking about this exact subject quite a bit these past few weeks. Again, I wouldn't say that we've necessarily had a passion for the subject outside of our own family but a few things lately have been awakening some new ideas within us. Morton raised an argument which had grabbed my attention a few days before I began reading this book and that argument is one that pro-choice people tend to lay at the feet of pro-lifers. The pro-choice argument goes that it's all fine and good to say that we believe mothers should "choose life." However, they argue that unless we are willing to provide the practical help necessary to enable the mother to have and then raise the child, we ought to just shut up. I think this is a fair charge to lay at our feet. We can say, "Choose Life!" all we like but if we aren't willing to provide the time, money and love necessarily to keep a mother and her child functioning and thriving then what good are our words? They end up sounding hollow and mean nothing. I think it's time to answer their argument by putting some action to our words. I think if we did that, we might be surprised by how the abortion number begins decreasing around the country. Reading KnowOrphans broadened my understanding of what can be done to support the orphan. Money is obviously a high priority because, well, it helps make the world go 'round. He notes several organizations that work to provide meals and education for children in single-parent or economically challenged homes so that families can remain intact. He also notes that while not everyone is called to adopt, everyone is called to help care for orphans and widows citing the oft referenced James 1:27. You might not give of your home but there are money issues as well as the opportunity to serve orphans with your time. Perhaps a family in your church feels called to adopt? You could support their efforts with a check and/or meals and/or childcare to offer the parents some relief and assistance. Donate old maternity clothes to your local crisis pregnancy center. Take time out to counsel young women who have recently discovered that they are pregnant. Drop a bag of groceries off at the home of the single mom that you know or bring her a meal. The opportunities really are endless once you get to thinking about it. I also like that Morton calls men out specifically to rise to the challenge of caring for orphans - not just leaving the burden of childcare to women. Many children without fathers need a father figure in their life. Men should be leading the charge to protect and defend the fatherless. It's what they are designed to do. KnowOrphans really opens up doors for good conversation between Christians. There are a lot of ideas for how to engage in ministering to children in need of family. The church should be that family - it's what we're called to. As Morton noted, there is a resurgence within the church to tend to meet the needs of these children and that is beautiful to behold. But there is still work to do. Morton may have fanned the flames on Jonathan's and my fires a bit. I was blessed to read this book and would recommend it to get the mind engaged on the plight of the orphan - and what you can do to provide relief. Again, it doesn't mean you have to adopt but there is no doubt a role that you can play. Will you find it? It's an interesting question to think about. Many thanks to Litfuse Publicity who sent a copy of this book my direction in order to facilitate this review. To see what others thought of this book, visit the Litfuse Publicity page for KnowOrphans. I received no additional compensation for this review and all opinions are my own. So what do we do in the meantime? What does that look like now while our home is still empty versus later when our home is full? I'm not sure what it means later, but right now we're very involved in child sponsorship. It's a great way to support families who cannot fully support themselves. And I was rather surprised to find that my sponsored girls in Korea are living in a children's home (I didn't know this until after our sponsorship started). I have no idea of their circumstances, if their parents are alive and unable to support them or if their parents have died. I only know that the girls are not available for adoption. I may not be able to adopt them, but I can send them letters of encouragement, a birthday gift, etc. It's one small way to help even if I cannot adopt them. Maybe someone else will have some ideas to share? This sounds REALLY GOOD! I could go on and on in response to your review as I agree that adoption is NOT always the answer and it is not for everyone. I love that he thinks children are better off 1)first in their home of origin, 2) secondly in their culture, and only 3) as athird option adoption.